Deed formats and terminology vary from colony to colony, county to county, time period to time period and from the handwriting and style of one clerk to another, all of which makes this a complex topic. As a basic primer, we are using a deed from Plymouth County, Massachusetts, chosen because it is short and legible! It is important to remember that the recorded copy of a deed is a copy, not the original. The transaction could take place without the deed being recorded, but it was in the best interest of both parties to have it placed on official record in case the original was lost and/or any questions about title should come up in the future. The deed would be copied into the “copy book” by the recording clerk and the original would go home with the grantee. There are, therefore, opportunities for errors or omissions to have been made in the copying. The recording clerk may have also written the original deed, but few of these survive because they disappeared with long-lost family papers. Price: The grantor confirms the price he has received and/or the conditions under which he is to be paid: “twenty eight pounds and six shillings & eight pence lawful silver money.” All types of currency, goods, services or land exchanges may have been involved, their intrinsic values fluctuating under economic factors. Description of property being sold: “five acres in Scituate in Lichfield’s Pasture, being the 61st Lot in the first division of Scituate Common Land originally laid out to James Studley.” Apparently, land granted to Studley ended up within the bounds of Lichfield’s farm, so with this deed the title was cleared by the exchange of money. To determine what and where the 61st lot in the first division of Common Land was you will need to go to the town history. Deeds may include reference to a volume and page of the deed books where the land was bought by the now grantor. Some will state that the property had been inherited and from whom. More often than not, however, the deed will not explain how the grantor obtained the property, only that he claims to have the legal right to sell it. Legal paragraph: “To have & to hold,” in which the grantor warrants the sale. In this example it is short and does not include conditions, but any special circumstances under which the sale is being made will be given – e.g., parents transferring land to their son under the requirement that he take care of them for the rest of their lives. If a wife is releasing her dower rights, it will appear in this section. While the boiler plate portions of this paragraph do not need to be transcribed, the text still must be carefully read for any unique information, not found in all deeds, but extremely valuable when it is there. 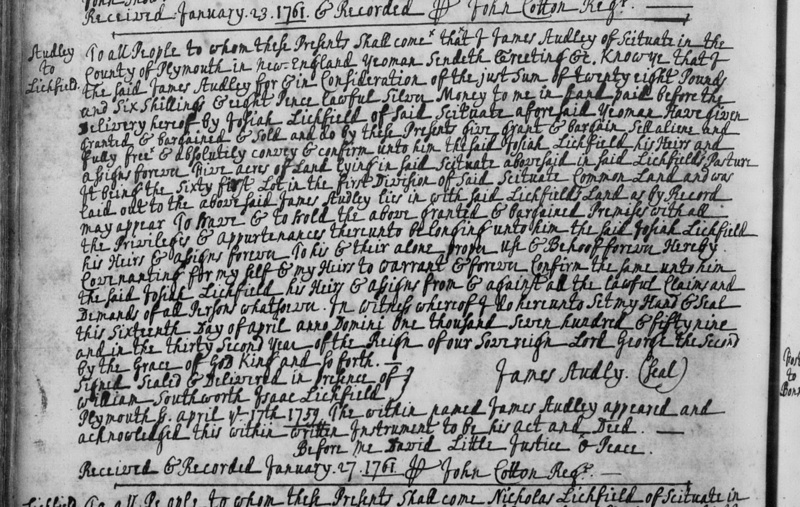 Plymouth County Deeds, 46: 188, accessed at familysearch.org, “Massachusetts Land Records, 1620-1986” collection. You’ve got me pondering dower releases. Execution of them seems somewhat arbitrary. Can you tell me if there were any particular triggers that would set that in motion? Value of the transaction? Habits of the clerks? Belligerent wives? Wealthy/influential fathers-in-law? Thanks! Hi Polly, I am not aware of any triggers such as you mention. It was definitely arbitrary and may have depended on whomever was drafting the deed and/or overseeing the legal aspects of the transaction, if there were such a party. These all derived their authority from William Blackstone (Google), the Anglo-American Legal “Bible” and the actual published local laws on the matter. Cf the various editions of “Acts and Resolves of … Massachusetts” gathering dust on many local Mass. library shelves (Concord Free Public used to keep them on the shelves just under the old original building rotunda). A Widow’s Portion of a deceased male’s estate is usually thought to apply to ALL of the deceased husband’s property. It would be more accurate to say that it covered all of the property she was LEGALLY entitled to have an “interest” in. IF the man had bought or received land BEFORE their marriage, that wife had no “interest” in it. IF he bought or received land AFTER their marriage, she had an “interest” in it. When her dower rights needed to be “waived” to facilitate a sale, the JP was under legal obligation to question her separately to insure she was under no duress in making a waiver. This proviso existed (still exists) because HER property became HIS property upon marriage and it was long recognized that his willy-nilly selling of same was not “fair”–and also that it would increase the chances of her becoming a public charge after his death. Now, IF she had brought property into the marriage, and he died BEFORE her, control of that property reverted to her. There are several women profiled in GM who clearly chose NOT to remarry so as to continue to manage their property rights as they saw fit. Genealogically, IF a woman does not release dower rights on a deed, it MAY mean 1) she is deceased, 2) the land being sold was bought/granted to him before marriage, or 3) he’s just being a so-and-so. That means looking at other material so as to determine which option of the 3 above it is. This research can be crucial in determining such questions as “Is the Mary in the will that same Mary that he married as a young man, given a 10-year gap between known children.” There are other such questions that can be addressed by keeping these “guidelines” in mind, guidelines that were in fact legally codified and that were expected to be followed. Thank you for bringing deeds to the forefront. They are one of the most valuable — and most underutilize — resources for research. You mentioned this: “To determine what and where the 61st lot in the first division of Common Land was you will need to go to the town history.” Could you point us to how to find this town history? Thank you. 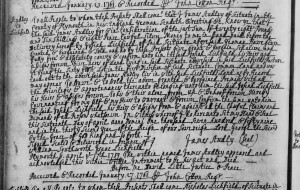 Correction – in my note – the Josiah is likely NOT the same person in the post, as the Josiah who was adopted by John Allen died in 1708, but it could be his grandson, b. 1716. Carole, actually, rather than the History of Scituate, the better source is “The Seventeenth-Century Town Records of Scituate, Massachusetts” by Jeremy Dupertuis Bangs, three volumes published by the NEHGS in 1997. Succinct and clear. This should end up as a 2 page Portable Genealogist publication. Note: Error rates in copying (by MODERN rule of thumb) can run up to 20%. Given the importance of recorded deeds, recorders did work to keep copy errors down to say less than 5%; this can be seen in the few marginal “corrections” in the official folio volumes, and often those interlineations are noted as “interlineations” that appeared in the original copy. Note: There would be a THIRD copy, that retained by the Seller. This only marginally increases the chances such a document might still survive. And the only way to know? Create an eBay search! 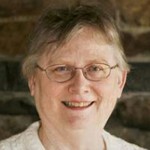 Leslie Wilson of CFPL runs such a one with various key words centered around “Concord” (a lot of Concord stuff has “walked away” over the centuries, but is out there and will surface, and she has a budget). Bob, thanks. Errors of omission seem to be the biggest problem, when the clerk skipped a line. My guess is that there are other records that confirm the grantor’s surname is Studley. When I first read it, I transcribed it as Audley. I can see now that it is more likely to be ‘St’, not capital ‘A’. To me this brings up one of the harder aspects of transcribing old documents–the names. Other words can often be deciphered from context plus repetition within the document, but not always names or unique words. I find that transcribing the ‘known’ formulaic parts helps me decipher the handwriting and spelling of the clerk, making it easier to decipher the unique parts of the document. Roger, Yes, it takes study and familiarity with the handwriting and styles, as well as with surnames. Those used to Plymouth County would know there are no Audleys in the area, but plenty of Studleys. I also find it interesting that formulaic phrases from 17th century wills and deeds have survived in to our modern culture. ‘To have and to hold’ in the traditional wedding vows. And the other one I keep humming when I’m transcribing is ‘Signed, sealed, delivered’ –the chorus tag line of a 60’s song. Happy Thanksgiving! Even thinking about looking at old deeds is scary business for one who, like me, hasn’t done it before. The one you’ve chosen to begin with makes sense. So thanks, Alicia, and commentators, for helping to give me a bit of courage to dig into this obviously valuable resource!